The Oxford Centre for Tropical Forests (OCTF), based in the University of Oxford’s Environmental Change Institute (ECI), was established in 2008 with funding from the Oxford Martin School (formerly the James Martin 21st Century School). It is led by Professor Yadvinder Malhi, and incorporates a network of organisations, including charities, private businesses and public sector organisations, as well as various Oxford University research groups. Tropical forests are perhaps the greatest treasures of life on Earth, housing half of all biodiversity, much of which has yet to be observed or described. 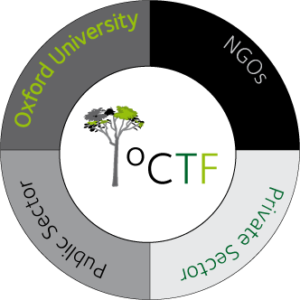 The OCTF brings together Oxford’s vast intellectual capital and expertise on practical issues in this area, with the aim of fostering links between all those interested in the past, present and future of tropical forests. OCTF general membership includes all interested individuals and organizations available to attend OCTF events. Members currently include NGOs, private sector members, university members and public sector organizations, all in and around Oxford. Read more about our Member Organisations.